Prior to beginning his career in EMS five years ago, Don Weeks was laid off from his job manufacturing bridges, such as the Hoover Dam Bypass and the San Francisco Seismic Retro-Fit Project. Don had promised himself that if he was ever laid off he would go back to school. Don has always liked helping people and a career in EMS made sense for him. Don started working for Bay Cities Ambulance four years ago as a part time wheel chair driver and EMT. During this time Don decided that he wanted to become a Paramedic. 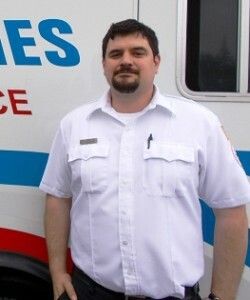 Don secured a full time position working on an ambulance as an EMT, while going to school. Two years later, he became a nationally registered Paramedic. Within a few months he was promoted to Senior Paramedic, the position he holds today. Don looks forward to the future when he can become a Field Training Officer and train future generations of Paramedics. Don and his wife, Nicole, have one daughter and are expecting their second daughter this summer. Bay Cities Ambulance is proud to honor Don Weeks with the American Ambulance Association 2016 Star of Life.